A touch-free haptic control system that enables users to “feel” virtual buttons and dials in mid-air has been demonstrated onboard a Bosch concept car at this week’s CES exhibition in Las Vegas. Developed by Bristol firm Ultrahaptics Ltd, and spun out of research carried out at Bristol University, the novel interface uses ultrasound to project sensations through the air, enabling users to “feel” buttons, dials and other objects in mid-air. 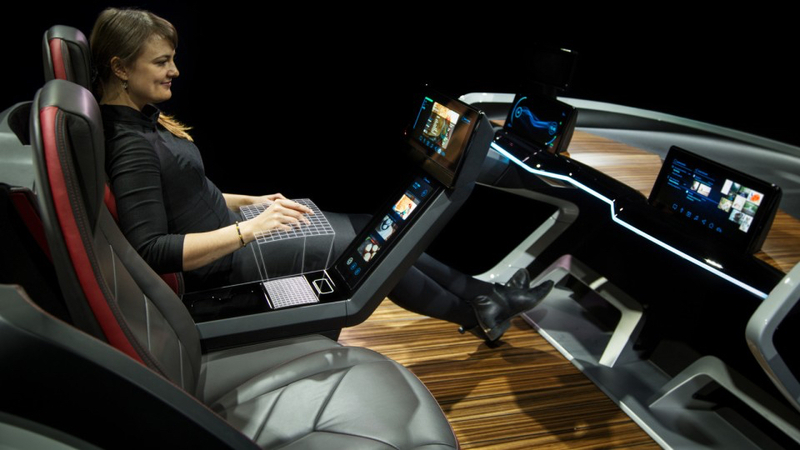 On the concept vehicle Bosch has used the technology to develop an advanced gesture control system for its infotainment system, with the haptic feedback used to reassure drivers that their hands are in the correct position to make an effective gesture command. According to Bosch, the technology promises to make the use of gesture control systems safer as it reduces the need for drivers to take their eyes off the road and check the display visually. Commenting on the latest application of his firm’s technology Steve Cliffe, CEO of Ultrahaptics, said “[it] demonstrates how touchless gesture-recognition can help car makers gain greater market acceptance for the incorporation of gesture control”. Bosch is said to be working with Ultrahaptics on a number of other applications, whilst the Bristol firm is also exploring the potential of its technology across a range of industrial and consumer applications. making rude suggestions about other driver’s performance may never be the same again! Actually, how am I going to ‘conduct’ and sing-along to the orchestras which are on the CDs in my car now. Though perhaps here is a new entertainment system: gesture played musical instruments, indeed an entire orchestra and composition of immediate music at the disposal of anybody who can wave and point a finger? To change channels, volume etc. wouldn’t it be better to use Alexa technology? “gesture played musical instruments, indeed an entire orchestra and composition of immediate music at the disposal of anybody who can wave and point a finger. I had to look up Theremin…but you are probably right! One of my clients in the 80s was the firm (Gentex Inc in the USA) who made, as a special both (US and USSR) the helmets for the “Firefox” film. If I recall such was the (even then) state of that art that pilots could select targets by thinking about them: and then launch ‘hot rocks’ to destroy such. Hollywood clearly had ideas way beyond reality, so nothing new there! But who knows what is now possible. As has been stated on several previous occasions in our august organ: the concept of some future conflict entirely conducted ‘virtually’ (in the minds of the various leaders…) is surely sound. Particularly as it is the ideologically defined ideas in the mind of the same leaders which are the basis for any physical attacks. Edward de Bono surely dealt with the situation with his ‘bribery’ rather than ballistics approach. Mike B Firefox was a bit of alternative Spy Fi from the pen of a Welsh Author Called Craig Thomas Fairly certain Brain reading Helmets were not so advanced in the mid 70s that they could be used in the aircraft of the time. Not even sure they are quite there yet, although I understand that watching cockpit footage of an Apache Pilot in action is quite disconcerting since each of the pilots eyes operates independently of the other whilst operating the targeting view and the flying view.